Whilst different artistic pursuits offer their different pleasures, theatre offers something that art, film, TV and literature struggle to match; it is the only medium whose primary output is never static. Either a production reworks an existing play or it is new work that is in a constant state of evolution. There is also never just one output, each performance will be unique and, in a longer running show, a company is likely to seek improvements by continuing to tweak the production. 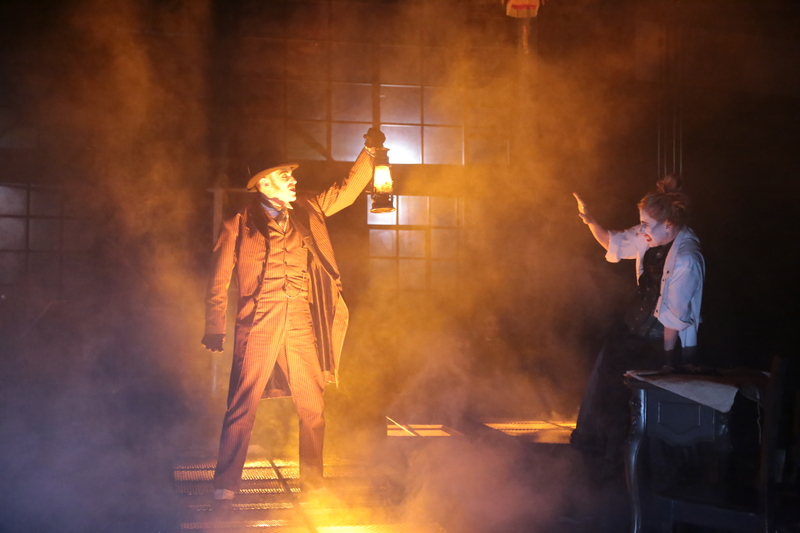 It is the last of these reasons that drew me to Jekyll & Hyde at Platform Theatre. Two years ago Red Shift partnered Flipping the Bird to produce an adaptation of Robert Louis Stevenson’s famous story. My recollection is of a frustrating experience as it showed real promise but was undermined by a script that ought to have gone through several more drafts. (Previous review here). Having gone through the Edinburgh experience and onto China after the Chung Ying Theatre Company recruited Red Shift founder, Jonathan Holloway, I was fascinated to see how the play might have transformed. There was anticipation over finding out how cultural collaboration had affected it, and how it been altered in the interim. The results, to be perfectly frank, were disappointing. The play, rather like Dr Jekyll, seems to be suffering from a crisis of identity. Mr Holloway has come up with a neat premise (altered from the previous version), where Dr Jekyll is a woman looking to transform herself into a man due to experiences suffered in her war-torn homeland. Transformation becomes a survival mechanism, and her physical transition is accompanied by a psychological one so that Hyde is a manifestation of that which she most fears. It is a strong concept that allows the audience to draw parallels with the modern world. However the premise is never explored to any great depth. This is mainly due to haphazard plotting that has reduced Jekyll to a peripheral figure. 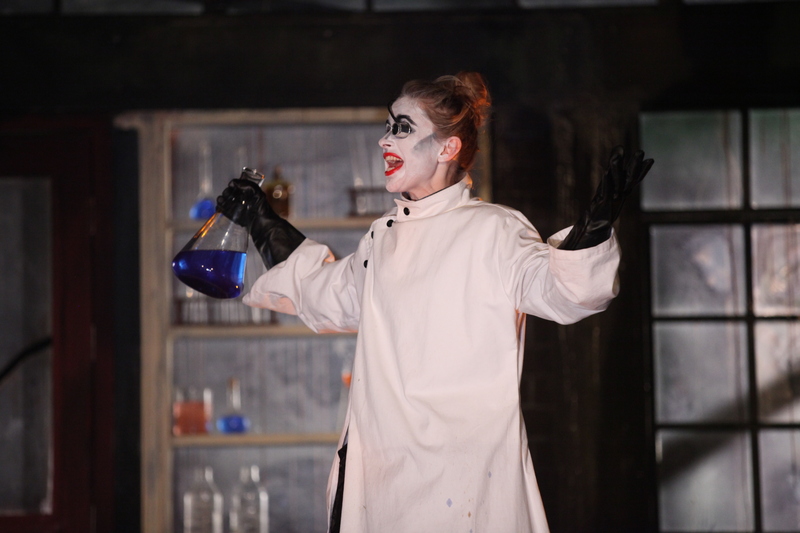 Olivia Winteringham’s Jekyll/Hyde is the most interesting character in the play by some margin, and she is also the company’s strongest performer, and yet there is very little for Ms Winteringham to do. Her physical transformation is splendid and, even as Jekyll, she presents a suitably eerie poise. When she is onstage the energy increases substantially to match her presence. However the production spends great lengths setting an elaborate framing device that enables the story to be told after the event rather than as scenes set in the present. There is an advantage in this, as it allows a greater degree of control over the reveal of key information thereby heightening the tension for the audience. The problem is that, once set up, unless it is integral to the main story, the framing should be exactly that – a frame within which to watch the action. Yet here the production seems to spend as much time admiring the frame, as admiring what’s within it. By continually returning to the narrator, the tension is severely diluted and the audience is forced out of the moment. The other element that sidelines Jekyll is that the play seems far more interested in Utterson. He is presented as a rounded character, and relationships are developed with Enfield, the person who leads him into this macabre world, and Utterson’s potential partner. The result is that Jekyll gets squeezed out. She has some scenes that interact with these characters but they only serve to make her character appear vindictive and spiteful. Issues remain with the writing. The delicate premise – touching on serious and powerful issues – is too roughly handled. The play improves in the second half when the focus narrows onto the Utterson/Jekyll/Hyde dynamic but before that there is truly clunky dialogue, and whole paragraphs exist only to serve as exposition The dialogue could almost be acceptable as pastiche but if the premise is to be taken seriously then to present it as pastiche would be highly insensitive. Perhaps the most disappointing aspect is that the beautiful set design that accompanied the previous production has been replaced with an entirely functional, but rather generic, Victorian gothic design. This may be a result of increasing the size of the venue, as the earlier design was well-suited to the intimate nature of Edinburgh venues and may not have been scalable. If this review sounds unfairly critical then reflect on the last time a Chinese theatre company were provided the opportunity to perform in England. It is highly disappointing that when it does happen the end result is a limp adaptation of a well-known gothic horror rather than presenting something that genuinely does express cross-country collaboration. One looks to Cheek by Jowl in France and Russia, or the truly bizarre Three Kingdoms to see how engaging international collaborations can be.